Champions is a mod that adds elite mobs of different rarities, with enhanced stats, extra abilities, and extra loot. These champions can be spawned for any hostile mob in the game. Many aspects of this mod can be configured with either the config file or the generated json files, allowing users to adjust the difficulty and diversity of this mod to suit their particular playstyle. Champion mobs are defined by their ranks. Every time a valid mob is spawned into the world, it's assigned a rank. 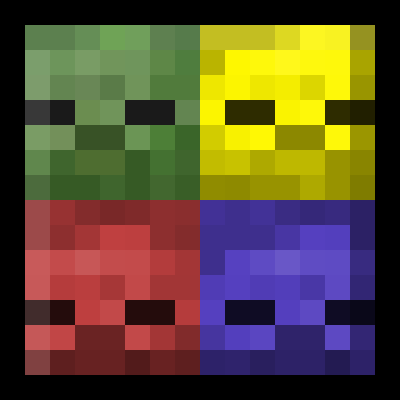 Most mobs will be common and exhibit no special characteristics. Some mobs will spawn as champions. Players can recognize them by the special colored particles they emit as well as the special health bar that appears on your screen when you look at them. Champions have ranks which are randomly assigned with higher ranks being progressively rarer. With each rank, champions gain stronger stats, more abilities, and more loot to drop. Ranks are extremely configurable through the use of the ranks.json file generated in the config/champions folder. Players can edit rank attributes such as default color, number of affixes, growth factor, and chance to spawn. New ranks can even be added, infinitely. More in-depth information on the ranks.json file is located at the GitHub Wiki. Affixes are unique abilities or attributes that spawn with champion mobs. Players can see which affixes are attached to any champion by looking underneath the champion's health bar on the screen. These can be identified from a fair distance away, allowing players to sufficiently analyze each champion's threat level and available abilities. Affixes, like ranks, can also be configured through the use of the affixes.json file generated in the config/champions folder. Here, players can disable certain affixes, require certain ranks, blacklist entities, and make specific entities always spawn with certain affixes if possible. Unlike ranks, new affixes cannot be added in any way. More in-depth information on the affixes.json file is located at the GitHub Wiki. Arctic - Continuously fires homing projectiles that will slow anyone they hit. Dampening - Reduces the damage of indirect attacks. Desecrator - Periodically spawns a cloud of harming underneath its target. Hasty - Drastically increases movement speed. Infested - Attacking and being attacked will spawn silverfish that will attack its target. Jailer - Small chance per attack to "jail" targets, making them unable to move positions for a few seconds. Knockback - Increased knockback from attacks, which will also slow targets for a small period of time. Lively - Regenerates 1 health per second. This increases to 5 health per second when not attacking or pursuing any targets. Molten - Grants fire resistance, fiery attacks, and armor penetration. Reflecting - A small portion of damage is reflected back at the attacker. Shielding - Periodically shields itself from all damage. Vortex - Periodically pulls targets towards itself. In addition to the json files mentioned above, Champions has a general configuration file. Here, players can specify things like dimensional blacklists/whitelists for champion mobs, client color overrides for ranks, and values to use for stat growth for champions. Champions has support for Game Stages for staged champion mobs and staged rank tiers. More information about this can be found on the GitHub Wiki. So... how's this as a champion affix idea? When this champion attacks the player, it will claim their soul and a timer will appear for the player as a potion effect & chat message. "Champion mob claimed player's soul." The player must kill the champion by any means to reclaim their soul back before the timer reaches 0... otherwise the champion will fully claim their soul and then shatter it which results in an instant kill with this death message. "Champion mob shattered player's soul." The timer would start at 60 seconds or a configurable amount, can also have it be based on the tier if you wanted. Unsure of what type of status it should be. Maybe as a negative potion effect that can be cured by drinking a Bucket of Milk? It could be something else if you only want it to be reclaimed by killing the champion. Hm, I'd like to have it be more engaging/strategic than just "kill this champion fast", since that's what this basically boils down to. Maybe some sort of soul gauge and a method to stop the soul stealing? I'd have to workshop this idea a little bit, but there's potential here. Something like that could work, actually. What kind of method to use though to stop the champion from stealing your soul? Hi, I wanted to ask, and how does the chance of the appearance of mobs work? Is it counted from previous or all from one value? It's counted from the previous ones. So if you increase the chance of one tier appearing, you also increase the chance of higher tiers appearing. Can this be used server side only or do the clients need it as well? Clients need it as well. Well I got to say you do some great work there. I recently made 2 feature requests and you immediately implemented them making it allot better to customize the mod for modpacks (only player kills drop items (config option) from champions and the Config option for X and Y-offsets for Champion health bars on the HUD) both options work great toughly tested them especially the item drops finally no one can farm creative modifiers by simply having some mob farm running. Oh, sweet! Another mod to make my world unforgiving. :D Imma download it! Thanks for the kind words, glad you enjoy them! Latest update seems that the death message is popping up in chat even when, "Death Message Tier"=0. Loving the mod, I like it when players have to sometimes just run away from mobs. I am bothering by this message too. According to tooltip, that disable value is -1. But that message is not became invalid either 0 or -1. This has been fixed in the latest version, 1.0.6. By default they should at least be dropping enchanted books, in addition to their regular loot. Are you getting nothing at all? Because that doesn't sound right. As for a more user friendly way to edit drops, do you have a particular idea in mind? I've tried to make it about as user-friendly as I can manage already considering how the Minecraft loot system functions. Question Regarding the scaling health implementation. So I can’t figure out how its calculated does the 1;0.02 mean it calculates it like this X*Y*0.02 if the base spawn chance for a Champion mob is tier 1 is X and the current difficulty scaling is Y. So if I set the rank spawn chance for tier 1 champions to 0.02 and than in the set the scaling implementation to 1;0.025 does that mean it calculates like this for difficulty 200 (0.02*200*0.025=0.08 à 8% spawn chance at 200 difficulty)and for difficulty 30 (0.02*30*0.025=0.015 à 1.5% for difficulty 30) did I get that wrong? Because it doesn’t seem to increase the spawns of champions when I have difficulty at max (200) compared to it being at 0 ???????? This was a bug that I've fixed it the latest version, 1.0.5.1.